SUMMARY: As many seasoned marketers know, too many leads can pose problems in later stages of the marketing funnel. See what tactics B2B marketers use to balance lead quality and quantity in their online efforts. Q. Which of the following tactics do you use to balance quality and quantity of leads? The website has become a main point of conversion for multichannel lead generation campaigns. In fact, the 1,745 respondents of our B2B benchmark survey rated its design, management and optimization as the top B2B marketing tactics for 2012. In the above chart, we show how organizations balance the quality and quantity of B2B leads, by optimizing the landing pages on their websites. The number of required fields on a landing page has a great impact on both the quantity and quality of leads. Limiting the number of required fields on a landing page can increase the quantity of leads, but overall quality may be low. Including a complex form with many required fields on the landing page may produce a lower volume of leads, but since those leads were motivated enough to fill out a long form, they are likely of higher quality. 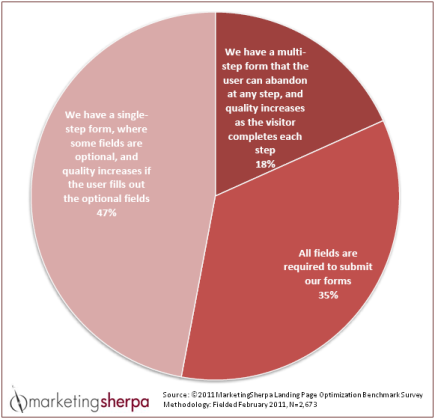 The majority of B2B marketers are balancing quality and quantity of leads by incorporating optional fields on their landing pages, with a higher number of optional fields completed indicating higher quality. For additional research data and insights about B2B marketing, download the free excerpt from the 2012 B2B Marketing Benchmark Report: Research and insights on attracting and converting the modern B2B buyer, and join us at this year’s B2B Summit in Orlando, August 27-30. Webinar Replay -- "How to Accelerate Lead Quality and Conversions with Content Marketing Optimization"